Brendan James Fraser (/ˈfreɪzər/ FRAY-zər; born December 3, 1968) is an American-Canadian actor. He played Rick O'Connell in The Mummy trilogy, and is known for his comedy and fantasy film leading roles in films, such as Encino Man (1992), The Scout (1994), George of the Jungle (1997), Bedazzled (2000), Looney Tunes: Back in Action (2003), Journey to the Center of the Earth (2008) and Inkheart (2009). He also starred in numerous dramatic roles, such as Gods and Monsters (1998), The Quiet American (2002), Crash (2004) and Gimme Shelter (2013). Fraser was born December 3, 1968, in Indianapolis, Indiana, the son of Canadian parents. His mother, Carol Mary (née Genereux), was a sales counselor, and his father, Peter, was a former journalist who worked as a Canadian foreign service officer for the Government Office of Tourism. His maternal uncle, George Genereux, was the only Canadian to win a gold medal in the 1952 Summer Olympics. Fraser has three older brothers: Kevin, Regan, and Sean. His surname is properly pronounced /ˈfreɪzər/, not /ˈfreɪʒər/. The correct pronunciation of his surname is a running gag in Dickie Roberts: Former Child Star, in which his character's surname is pronounced /frɛrəˈʒʊər/. His ancestry includes Irish, Scottish, German, Czech, and French Canadian. His family moved often during his childhood, living in Eureka, California, Seattle, Ottawa, the Netherlands, and Switzerland. Fraser attended the private boys' boarding school, Upper Canada College, in Toronto. While on vacation in London, Fraser attended his first professional theatrical performance at the West End. He graduated from Seattle's Cornish College of the Arts in 1990. He began acting at a small acting college in New York. He originally planned on attending graduate school in Texas but stopped in Hollywood on his way south and decided to stay in Los Angeles to work in film productions. Fraser made a brief appearance in the reenactment of America's Most Wanted, as a friend of murder victim Rodney Mark Peterson. After his film debut Encino Man, he starred with Matt Damon and Chris O'Donnell in School Ties. In 1994, he played Steve Nebraska in The Scout and Montgomery "Monty" Kessler in With Honors. He went on to play supporting roles, such as Philip Ridley's The Passion of Darkly Noon (1995) and The Twilight of the Golds (1997). He went on to appear in several comedy films, such as Blast from the Past (1999), Bedazzled (2000) and Monkeybone (2001). He also starred in two films based on Jay Ward creations, George of the Jungle and Dudley Do-Right, but did not reprise his role in the former's sequel. He also starred in Gods and Monsters (1998), which was based on the life of James Whale (Ian McKellen) who directed Frankenstein. The film was written and directed by Bill Condon, and follows the loss of creativity, ambiguous sexuality and unlikely bonds between a heterosexual gardener and a homosexual, tortured and ailing filmmaker. His biggest commercial success came with the adventure fantasy film, The Mummy (1999) and its sequel The Mummy Returns (2001), both of which were hugely successful at the box office. He lent his voice for the unreleased animated film Big Bug Man. In 2004, he appeared in the Academy Award-winning film Crash. He has also made guest appearances on the television shows, Scrubs, King of the Hill and The Simpsons. In March 2006, he was inducted into Canada's Walk of Fame, the first American-born actor to receive the honor. However, as of 2014, he does not have a star on the Hollywood Walk of Fame. After a six-year hiatus in the franchise, Fraser returned for the second sequel to The Mummy released in August 2008 and titled The Mummy: Tomb of the Dragon Emperor. Filming started in Montreal on July 27, 2007 and also starred Jet Li as Emperor Han. His other releases in 2008 were the 3D film adaptation of Jules Verne's Journey to the Center of the Earth and the fantasy film Inkheart (chosen personally for the lead role by the novel's author Cornelia Funke). In 2010, he starred in Extraordinary Measures with Harrison Ford. Fraser starred as "Brick" in the West End production of Tennessee Williams's Cat on a Hot Tin Roof in September 2001, directed by Anthony Page. Castmates included Ned Beatty, Frances O'Connor and Gemma Jones. The show closed on January 12, 2002, with Fraser garnering many excellent reviews. In 2010, Fraser starred in a Broadway production of Elling, but the play closed after 9 performances due to lackluster reviews. After appearing in the critically panned Furry Vengeance in 2010, Fraser moved from being represented by William Morris Endeavor to the Creative Artists Agency. He starred in Whole Lotta Sole directed by Terry George and in 2011 was set to play William Tell in The Legend of William Tell: 3D, directed by Eric Brevig, with whom Fraser had also worked on Journey to the Center of the Earth. Filming was delayed and late in 2011, Fraser sued the producer Todd Moyer for promised wages. Moyer later countersued. Fraser dismissed the accusations as an attempt by Moyer to avoid paying his debts. The film is in development limbo. In 2016, Fraser replaced Ray Liotta in the upcoming Bollywood thriller, The Field. Fraser met actress Afton Smith while attending a barbecue at Winona Ryder's house on July 4, 1993, after arriving in Los Angeles. Fraser married Smith on September 27, 1998, and they have three sons: Griffin Arthur Fraser, born in 2002, Holden Fletcher Fraser, born in 2004, and Leland Francis Fraser, born in 2006. After their Beverly Hills home sold in April 2007 for $3 million, Fraser's publicist announced on December 27, 2007, that the couple had decided to divorce. In early 2013, Fraser petitioned the courts for a reduction of his alimony and child support payments, asserting that he was unable to meet the annual obligation of $900,000; his ex-wife, in turn, accused Fraser of hiding financial assets. Fraser speaks fluent French, and serves on the board of directors for FilmAid International. He is an accomplished amateur photographer, and has used several Polaroids in movies and on TV shows, most notably on his guest roles on Scrubs. In his first appearance he used a folding pack camera; and on his second appearance he used a Holga with a Polaroid back, a Japanese-only model. The book Collector's Guide to Instant Cameras has a dedication to Fraser. 1 2 "Brendan Fraser's Looney Adventure". CBS. November 13, 2003. Retrieved August 24, 2008. 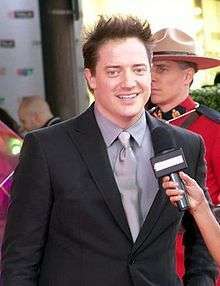 1 2 3 4 "2006 Inductees – Brendan Fraser". Canada's Walk of Fame. 2006. Retrieved August 24, 2008. ↑ Beale, Lewis (November 1, 1998). "In The Know Brendan Up To Buff In 'Gods And Monsters'". New York: NY Daily News. Archived from the original on December 5, 2008. Retrieved August 8, 2008. 1 2 3 Lynch, Lorrie (October 26, 2003). "In tune with himself". USA Weekend. Retrieved December 27, 2007. ↑ "Brendan Fraser Biography (1968–)". Filmreference.com. Retrieved November 2, 2008. ↑ "Daily Highlights – January 10 – Brendan Fraser Interview". Late Night with Jimmy Fallon. 1 2 Rota, Kara (January 22, 2010). "Brendan Fraser on playing the real John Crowley in 'Extraordinary Measures'". Irish Central. Retrieved May 1, 2010. ↑ Dougherty, Margot. "Brendan Fraser Comes Up For Air". LA Mag. Retrieved May 1, 2010. ↑ Diamond, Jamie (June 21, 1992). "UP AND COMING: Brendan Fraser; A Man Schooled for Success". New York Times. Retrieved January 8, 2008. ↑ Halpern, Lisa (February 10, 2005). "Fraser's Edge". Cornish College of the Arts. Retrieved December 27, 2007. ↑ "Gods and Monsters Credits". Gods and Monsters Official site. Retrieved August 24, 2008. ↑ "Albemarle – Archive". Albemarle-london.com. Archived from the original on September 26, 2008. Retrieved November 2, 2008. ↑ "Brendan Fraser Broadway debut shuts after one week". BBC. November 26, 2010. Retrieved November 29, 2010. ↑ Masarella, Linda (March 27, 2011). "Fraser finds 'Sole' in Ireland". Toronto Sun. Retrieved March 27, 2011. ↑ "Eric Brevig Re-Teaming with Brendan Fraser for 'William Tell 3D'". TheFilmStage.com. September 7, 2011. Retrieved April 22, 2012. ↑ The Deadline Team (July 13, 2012). "Producer Todd Moyer Files Lawsuit Against Brendan Fraser, After Fraser Sued Moyer". Deadline Hollywood. Penske Business Media, LLC. Retrieved February 5, 2016. ↑ Izzo, Michael (July 24, 2012). "Brendan Fraser Sued By Producer For Alleged Battery". Business Insider. Retrieved August 20, 2016. ↑ Bhushan, Nyay (June 15, 2016). "Brendan Fraser Replaces Ray Liotta in Indian Mafia Thriller 'The Field'". Hollywood Reporter. Retrieved June 15, 2016. ↑ "Brendan Fraser's Former Mid-Century Modern Home Back on the Market for $4.4M". Fox News. August 10, 2016. Retrieved August 20, 2016. ↑ "Brendan Fraser and Wife to Divorce". The Insider. December 27, 2007. Retrieved December 27, 2007. ↑ "Mummy Star Brendan Fraser, Wife Split After Nine Years". US Magazine. December 27, 2007. Archived from the original on April 21, 2008. Retrieved August 24, 2008. ↑ "Times are hard: 'Broke' Brendan Fraser fights to reduce alimony and child support payments to ex-wife". Daily Mail. February 16, 2013. Retrieved May 16, 2013. ↑ "BBC – Films – Brendan Fraser". BBC. Retrieved February 27, 2008. ↑ "filmaid.org Newsletter". FilmAid International. 2006. Archived from the original on July 6, 2007. Retrieved February 27, 2008. ↑ "TFF 2012: Spotlight". tribecafilm.com, Inc. March 8, 2012. Retrieved March 28, 2012.